At Home Care Assistance of Fairfield County, we strive to provide the highest quality care to our clients developing personalized care plans to meet each individual's needs, goals and preferences. 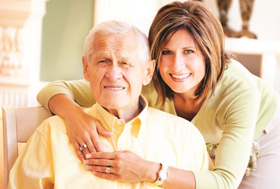 While most agencies merely offer a general plan of care to the unwell, Home Care Assistance features three specialized areas of home care: Balanced Care, Dementia/Alzheimer's Care and Post-Hospitalization Care. When evaluating in-home care options for a loved one, remember that not every home care agency or private caregiver can match the level of quality and expertise that Home Care Assistance is proud to offer each and every client. All caregivers receive training in our Balanced Care Method, which is a holistic program that promotes healthy mind, body and spirit for aging adults. Cognitive Therapeutics is a fun, engaging activities-based intervention program offered to individuals with the neurocognitive deficits associated with Alzheimer's and other forms of dementia. Hospital to Home care is a comprehensive program designed for seniors preparing to transition from a hospital stay back home. A member of our Home Care Assistance Fairfield County Client Care team is available to assist you around the clock, seven days per week. Please give us a call at 203-955-1915. Changing the way the world ages... Home Care Assistance! Home Care Assistance in every way ensured that I could meet her needs and help me to have time to care for the other myriad of things that go along with caring for someone who is sick. You don't know how much I needed you all. Thank you is not enough. I will recommend you and your staff to any and all that want or need to have someone take care of their loved ones with all of the glowing words that I can find. Until you walk in the shoes of a caretaker, you can't fully understand the help that you need. AND when you find it, it is a miracle. My heartfelt and grateful thanks to all of your miracles. I would like to thank you and the caregivers at Home Care Assistance for the care and compassion you provided to my father! My Dad had several medical complications which restricted his mobility and impaired his health. The assistants proved by Home Care Assistance were professional, knowledgeable and caring. Just as important, they were kind and compassionate human beings that significantly helped his mental outlook and provided friendship and companionship during a difficult period. My Dad genuinely enjoyed the friendship and trust that he developed with his caregivers. I also appreciate your administrative ability to coordinate with our long term care insurance company. I would not hesitate to recommend your service to others. Home Care Assistance raises exactly the right banner in promoting The Balanced Care Method as the foundation for all good care. In the rush of medical care systems that focus almost exclusively on problems, The Balanced Care Method encourages an approach which emphasizes creating strengths. For centuries we have known that better health in aging is tied to physical, emotional, social, and spiritual factors. Regardless of diseases, building on these basics of good health matters. But beyond creating strengths for elders, families that emphasize Balanced Care will come to work together and understand more clearly how to cope with medical problems and illnesses. The secret is in the strength of the foundation of care. The rest then comes into clearer perspective; complex situations and decision-making during this time of life are better understood and engaged. Home Care Assistance is about foundation-building for elders, families, supportive friends and, ultimately, for your health care team .